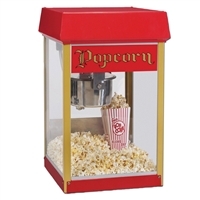 Citation Popcorn Machine, deluxe 16 oz. Unimaxx kettle, forced air popcorn crisping system, stainless steel dome, 2880 watts, 24 amps, NEMA 5-15P. APW Popcorn Popper 8 oz. 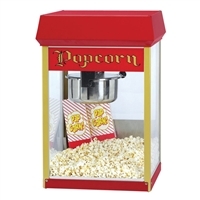 FunPop Popcorn Machine, 4 oz. E-Z Kleen/Uni-Maxx® removable stainless steel kettle, heated corn deck, tempered glass windows, twin arm kettle suspension, red dome, 688 watts, 5.7 amps, NEMA 5-15P. Fun Pop Cart, for 4 oz. 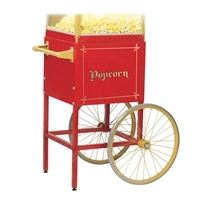 popper, steerable, storage compartment, easy access door, welded legs, (2) adjustable feet, (2) spoke wheels, red finish. Fun Pop Cart, 18" x 18", for 8 oz. 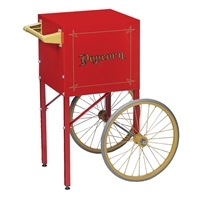 popper machine, steerable, silk-screened "Popcorn" graphic, rear access door red finish, gold corners posts, 20" wheels, welded legs & adjustable feet.